Imprints streamlines your mailings by offering addressing services. Follow these easy steps to request addressing services. Decide which service you need. Provide preprinted self-mailing materials that need addressing and postage. Imprints will print and apply inkjet-printed labels, applied according to postal regulations, for addresses, postage, and barcode. See Addressing Preparation for physical requirements of your mailing materials. Order self-mailing materials that need printing, addressing, and postage. Addresses, postage, and barcodes are printed directly on the materials as part of their design, in compliance with postal regulations. Because it eliminates label materials and labor, this choice lowers overall costs and processing. Provide or order envelopes for addressing and stuffing. Imprints prints and affixes address labels, then stuffs and seals envelopes. Use for messages that are sensitive or do not meet postal requirements for self-mailing. Provide or order the items to be addressed. Before you design and print your mailing material, contact Imprints Addressing Services, (858) 534-3020, for suggestions on saving costs and time. Your materials must meet the physical requirements specified below and in Addressing Preparation Services. All pieces in the same addressing job must be uniform. If Imprints will address your preprinted materials, deliver them to Imprints’ main production center in the Campus Services Complex. Folded material Creases must be sharp and uniform. Identify and 'cleanse' the list source. 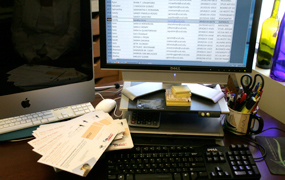 Imprints can print addresses on labels or directly on your mailings from your department’s mailing list or a campus mailing list created for you. Use your department’s mailing list. Use a campus mailing list generated for you. Use of some campus lists requires approval by the Academic Senate Office, Policy & Records Administration, or the list owner. Contact Imprints Addressing Services, (858) 534-3020, for details about the approval process. Note: All bulk mailing lists must have been cleansed and corrected within 95 days, with a certificate presented to USPS accompanying the mailing. Unless the mail owner can prove they have a current, clean list, Imprints will automatically cleanse lists to avoid delays and penalties. Volume discounts apply to entire order. The charges will appear in your department’s operating ledger as Imprints @ CSC. For more information, contact Imprints, (858) 534-3020.